Tags: Knock It Off! DIY Projects, DIY Projects, DIY Home, Decorating, Knock It Off! 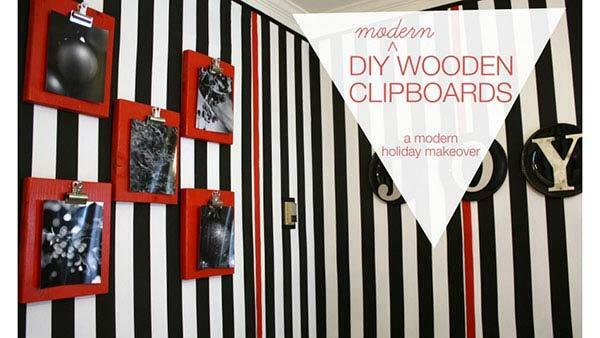 Make some easy "frames" for some holiday art by creating your own clipboards for cheap. The clipboards can be customized to match your decor with paint or stain. 1. Using the circular saw, cut the plank into 12 1-foot-long pieces. 2. Sand the edges of the planks to remove the roughness. 3. Paint or stain your planks in a color of your choice. For our modern room, we painted them with a glossy red spray paint, while we used a walnut-colored stain in our rustic room. 4. Take a binder clip and put it at the top of one side of the plank, centering it. Using a power drill and a screw, put a screw through the hole at the top of the binder clip, securing it to the plank. 5. Clip in your art and mount it on the wall!